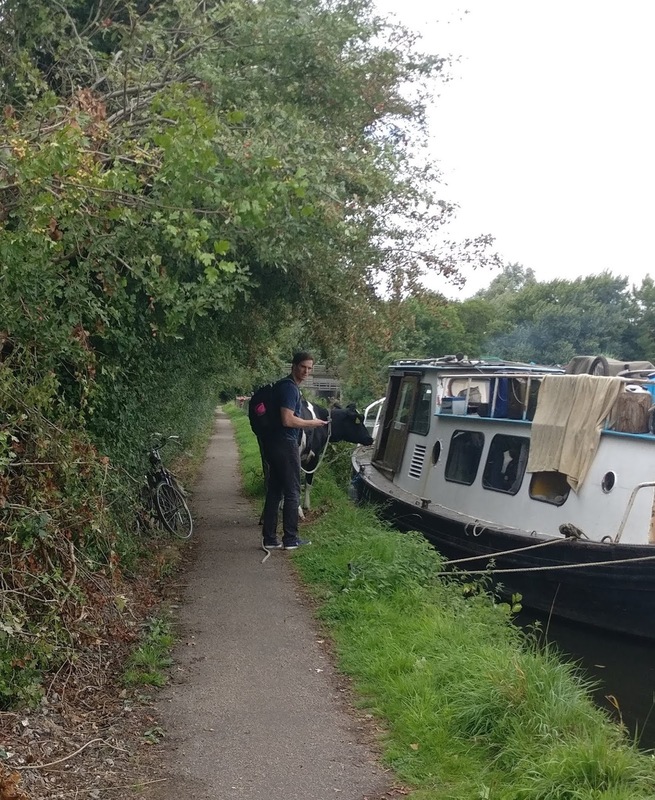 What a strange sight I saw ahead as I cycled along the Grand Union Canal yesterday. There was a man holding a rope tethered to a cow that was standing serenely in the canal next to him. 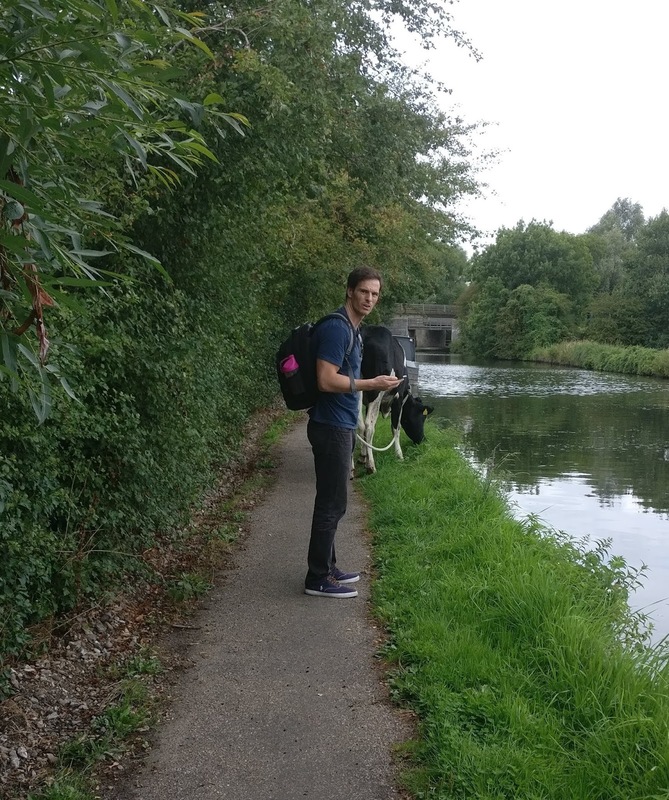 “Are you taking her for a walk?” I asked, somewhat bemused. “No,” replied the man, who I later came to know as Liam, who with his wife Joanna, had just moved to the area two weeks ago, from Cornwall. 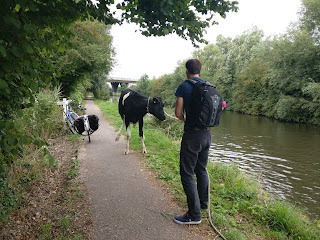 The married couple had been cycling along the canal, just as I had, but fortunately (for me) chanced upon the cow before me. I am not sure what I would have done in the same circumstances. This was clearly their ‘good deed for the day’ – and they even took the initiative to find a length of rope to tie around the cow’s neck to keep her from running away. They had already waited over half-an-hour and there was no sign of the fire brigade. I wasn’t even sure how they’d arrive along the towpath. 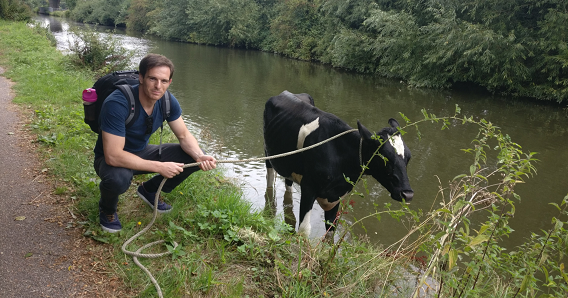 Liam and Joanna had no idea how the cow had found itself in the canal. 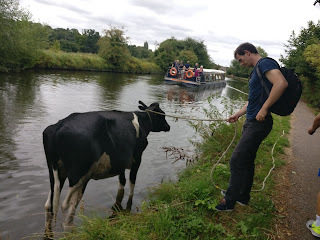 The cow had waded across the canal from the other side. There was no knowing which farm it had come from. A yellow tag attached to the cow’s ear gave the cow’s identification number, but it would have been useful to have included a phone number too. 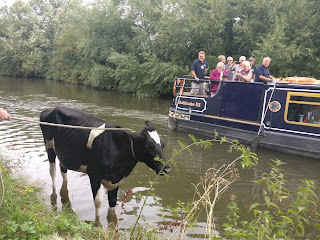 Passengers on a passing barge looked on agog as they motored passed the cow in the canal. Then a mum with her three young children turned up. The two boys posed for a photo with the cow. Then their little sister inadvertently stood in a wasps nest just next to the cow on the towpath. And that’s when the cow went berserk. The wasps started to sting her, and all the rest of us, including the children, who began screaming. 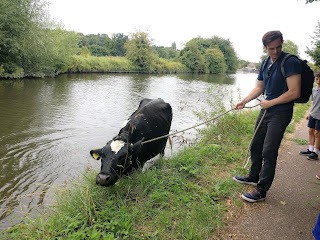 The cow jumped right out of the canal – with such vigour, I thought she was about to jump over the moon. I was stung about six times – so I was in no fit state to take any good photos of what happened next. And what happened next was dramatic. 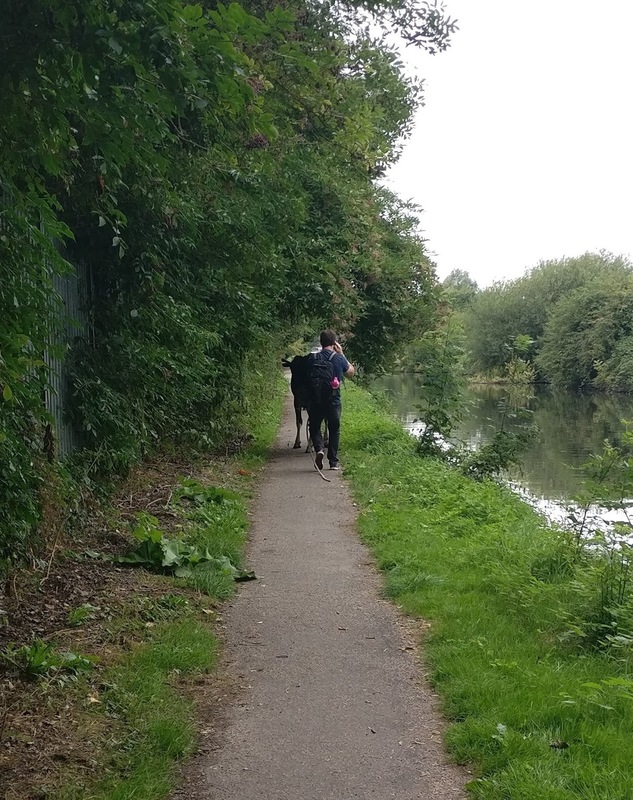 The cow started to gallop along the towpath, with Liam holding on to the rope attached to the cow’s neck, running as fast as he could to keep up – and amazingly, not letting go. And, with his other hand, trying to phone for help. I had to get back on my bike to keep up. But I can tell you, it was scary. The cow could turn around at any time and come straight back towards me. At one point, the cow stopped and started mooing very loudly – as cows do. Liam, bravely, didn’t let go of the rope. Then the cow stopped, at least for a moment, giving Liam a chance to phone back the fire brigade. “Are you on your way?” he asked, somewhat anxiously, unsure if, at any moment, he’d be back in a scene from a wild west rodeo. I gather the fire officer asked Liam where is the cow now? 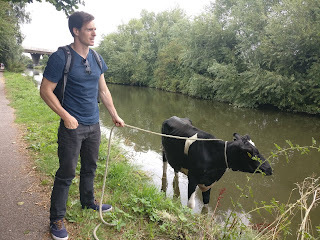 “The cow is now on the towpath,” replied Liam. Then Liam looked exasperated. 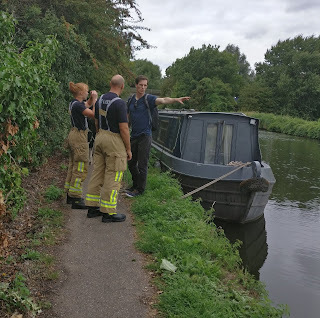 “The brigade are telling me that since the cow is now out of the canal, they can’t help,” he yelled out to me (I admit, I was keeping my distance). But clearly, Liam felt the cow was still his responsibility. The cow made it to a canal-side barge. 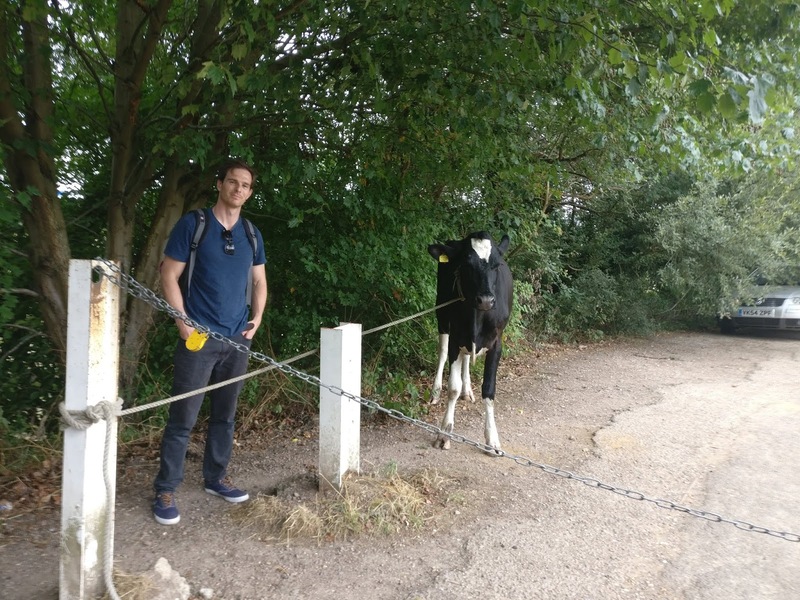 “Hello cow,” said a little girl as it looked as if it was about to climb on board. And then, they were off again, as the ruminant ran helter-skelter along the towpath, with Liam hanging with dear life onto the rope, with no hope but to go with the flow – there was no way of stopping the cow in motion. Then once again the cow stopped, and started grazing on the grass. Two fire brigade officers could then be seen walking along the towpath – they decided to attend after all. “We better take off our helmets so as not to scare the cow,” said the woman officer. "Yes, the cow is now on the towpath," explained Liam to the officers as they gingerly approached him and his cow. "But it was in the canal, over there," he pointed. 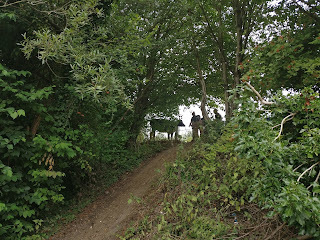 Then the cow was off again, scrambling up the embankment, its legs kicking the mud into the air, as it raced to the road side, with - you guessed it – Liam still holding on to the rope, as he ran with the cow. “We should tie up the cow to a post,” said the fire officers, when the cow had reached the top of the embankment and was catching her breath. So, the officers then helped to tie the cow to a post, but that’s all they could do they said, leaving poor Liam to tend to the big beastie all on his own. Liam agreed. He looked exasperated. His wife was somewhere back along the canal, who knows where? Liam muttered that he wouldn’t want to do a good deed again, either! I don’t know what happened next with Liam and the cow. Maybe he will tell us. On the ride home I decided to phone my friend to tell her what happened. The line wasn’t too clear though. Er not quite. Never mind. Tell you later. 'Hello there Jon, thanks for the picture, the cow looks great! Great writing and some good pictures. • Liam looks after the cow he rescued from the Grand Union Canal. • Passengers on a passing barge look on agog as they see the cow in the canal. • Liam and the cow... waiting for the fire brigade to turn up. • Liam with his wife Joanna - with two children who passed by with their mum and little sister. and then went crazy, jumping out of the canal. trying to phone for help with the other. as the cow looked as if she was coming on board. • As the cow stopped for some grazing, Liam was able to phone the fire brigade. • But two fire officers turned up anyway. 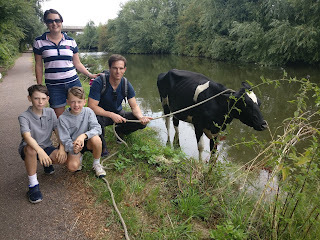 "Yes, the cow is on the towpath now," explains Liam. "But it was originally in the canal, over there." to the main road, where the fire officers manage to tie the cow to the post - and then left. Leaving Liam to tend to the big beastie all alone. 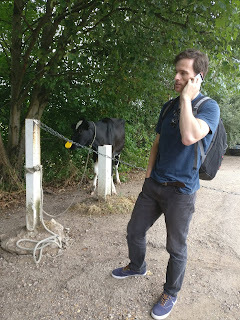 • Liam calls the police to report a cow on the run. • Liam and his new friend. They look good together!